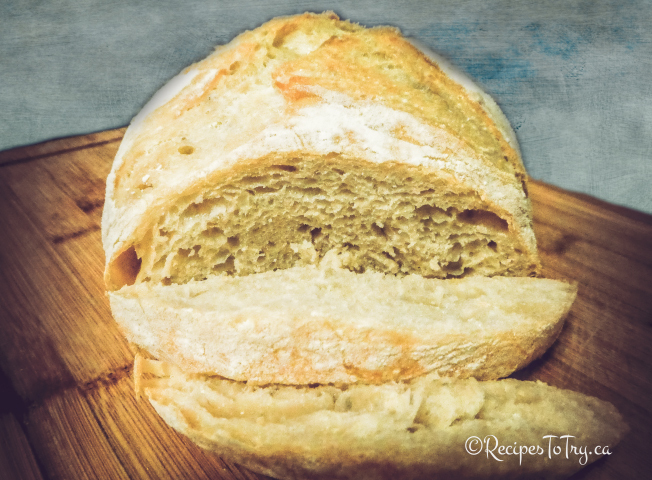 The recipe only has 4 ingredients and only takes 5 minutes of prep.It doesn’t require any kneading, and it’s touted s as “the easiest bread recipe in the world.” Delicious & Crusty on the outside; tender and soft on the inside. All I can add it’s the easiest and best bread recipe I have ever made. Mix dry ingredients until combined. Add warm water and mix until the flour mixture is absorbed by the water. The dough will be wet & sticky. ½ hours before you're ready to bake, gently pull the dough out of the bowl onto a well-floured surface, being careful not to puncture too many air bubbles. Gently with floured hands pull both the sides and fold onto the top. Turn seam down and tuck in the bottom to make a round shape. You can if you wish not to use parchment paper just let the dough sit on the floured surface for at least 30 minutes. Meanwhile, preheat the oven and Dutch Oven to 450 F, Let the Dutch Oven sit in the oven the entire 30 minutes. After dough has rested and the oven & Dutch Oven has preheated for 30 minutes, use a sharp knife to slash an X across the top of the dough. Transfer the parchment/dough into the Dutch Oven or if not using parchment paper spray the Dutch oven with cooking spray (to prevent sticking) and place the dough X side up into the Dutch Oven, cover and bake for 30 minutes. Remove lid after 30 minutes and bake an additional 5-15 minutes, or until bread is golden brown & registers 200 degrees on an instant-read thermometer. 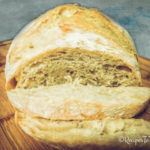 Immediately remove bread from the hot Dutch Oven and let cool on a wire rack for at least 30 minutes before slicing (otherwise it is too soft and will squish while cutting). The consistency of this dough is wet. However, depending on the humidity in your situation, you may need a little more water or flour to help the dough come together. If your dough is unreasonably wet, add more flour. If there are lots of dried flour pockets, add a little more water. You may have to add up to ½ cup more water if I'm using bread flour as it is much denser and heavier than regular all-purpose. You’ve probably seen loaves like this at your local bakery, often referred to as a “boule.” The outside is crusty and chewy, while the inside is soft and tender. It’s perfect for serving alongside soup, with a creamy dip, or for making hearty sandwiches. Why use a Dutch Oven?. For bread to develop that crusty crust as it bakes, it needs steam. Professional bakeries use ovens that release steam during the baking process to help create that signature crust. Home ovens don’t have steam injectors, so we have to improvise. By trapping the steam inside of a dutch oven as the bread bakes. Dutch ovens are like little mini-ovens that trap lots of heat and steam. Below is a video showing you how to make this bread.